We’d like to present our Silky Red Moodle theme to your attention. It is among the most recently added Free Moodle Themes and boasts clean design with a very eye-pleasing accent on the red color in the header area. The red color has been chosen due to the ideas of life and vitality that it provokes associations with, thus increasing the students’ participation in the online training process and hence the effectiveness of the learning environment the Moodle theme is supposed to create. 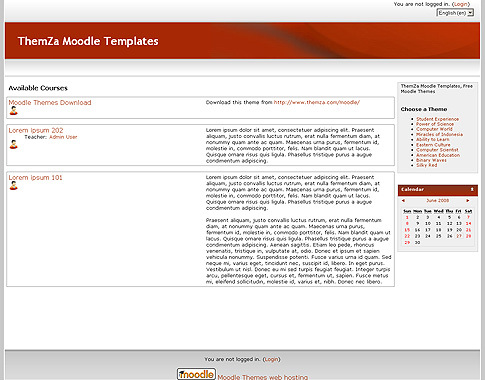 You can make the Silky Red Moodle theme your educational website template by simply downloading it from our website and adding it to your Moodle installation folder. To just get an idea of its layout and functionalities – please take a look at its online demo version. This entry was posted on Thursday, July 3rd, 2008 at 10:56 am	and is filed under Moodle. You can follow any responses to this entry through the RSS 2.0 feed. You can leave a response, or trackback from your own site.